(Natural News) This past year will be remembered for a lot of things, including the year that so-called fake news helped one unlikely presidential candidate win the White House. For weeks since President Donald J. Trump vanquished two-time presidential loser Hillary Clinton, a narrative emerged that “fake news,” as in propaganda, fed to hundreds of alternative media news sites by Russian intelligence swayed voters away from Clinton and into Trump’s corner. No proof has ever emerged substantiating this tin-foil-hat conspiracy, mind you. Nevertheless, this narrative has been expanded and made “official,” so to speak. President Obama has used it, in part, as his justification for sanctioning Russian intelligence and diplomatic missions and operatives. And it has been used by Congress and the president as justification to create a de facto Ministry of Truth within the U.S. government, ostensibly to identify and counteract the “fake news” and propaganda coming from foreign governments (a long-accepted intelligence/counterintelligence technique which happened all through the Cold War and remains in use today). And who will disseminate the government’s version of what is supposedly ‘the truth’? You guessed it: The very same ‘mainstream’ media institutions and outlets that have been creating and distributing fake news for decades. 1. ‘The Russians did it’: The Washington Post— The paper mainstreamed the narrative that “The Russians Hacked the Election” with a shoddy piece of journalism reporting that Russian intelligence gave hundreds of alternative media sites (including ours) “propaganda” in the form of “news” aimed at helping Trump and hurting Clinton [playing her role, Clinton would later blame it on some grudge Russian President Vladimir Putin held against her]. The sole “source” for the story was some shady, never-before-heard-of group of “experts” in various fields who claimed their “analysis” concluded without a doubt that Russian counterintelligence had meddled in our election. So flimsy and fake was the story that the Post eventually had to publish a sort-of retraction, admitting it’s story about fake Russian news was itself fake. What is even more pathetic is the Post’s attempt to deflect from its own journalistic failings by lashing out at social media giants like Facebook…for publishing fake news (which, of course, included those fake stories from the Post). In a post-election rant, the paper’s own editorial board laughably pointed fingers at social media for allowing stories to be published that no doubt hurt Clinton’s chances of victory but which were nonetheless truthful and full of unassailable details. The Post however, as we’ve demonstrated, is a purveyor of fake news. 2. ‘Hands up, Don’t Shoot’: The Mainstream Media—This phony narrative stems from the Michael Brown shooting death by Ferguson, Missouri, police office Darren Wilson, though arguably, CNN is most responsible for it. As noted by The Daily Wire, the MSM pushed the narrative that 18-year-old Brown, a black man, had his hands in the air (he did not) and shouted, “Don’t shoot!” (he didn’t) when Wilson killed him. Truth of the matter is, Brown began fighting Wilson and tried to grab his gun, which a grand jury later confirmed (as did a number of witnesses on the scene). For weeks CNN especially pushed this blatant lie, with some of its “news” hosts even putting their hands up on screen one morning, as a “symbol” of their “support” (for the lie). 3. ‘Trump told his supporters to vote multiple times’: CNN—Like him or not, there is no doubt that the MSM did its best to destroy Trump during the campaign, and that, of course, included ginning up fake news. CNN was, of course, in the thick of that. As Mediaite reported, the bottom-feeder “news” network made up a claim that Trump told his supporters to commit voter fraud by voting early and often. In fact, Trump was lamenting that in some polling places in Colorado, where he was attending a campaign event, void ballots four or five times, meaning they could probably vote four or five times. “But we don’t do that,” Trump also said, which was edited out of the original CNN story. 4. Helping Hillary cheat before a ‘debate’ against primary opponent Sen. Bernie Sanders: CNN: Longtime Democratic operative (which is why the network hired her) Donna Brazile worked behind the scenes to warn and inform the Clinton campaign about tough questions she was going to get ahead of a primary debate. Then, in what can only be adding insult to injury, the network executives acted shocked that a former associate of Clinton’s would actually use her media position to help an old friend. And of course, CNN has waxed sanctimonious about “fake news” also. 5. ‘Natural News is full of fake news’: Forbes—In recent days Forbes columnist Kavin Senapathy, the site’s “myth buster on health, food and science,” wrote a hit piece attacking Natural News and its founder, Mike Adams, the Health Ranger, as a “fake news” apparatus that pushes bogus theories and unscientific information. The defamation, of course, included all Natural News writers and correspondents, of which yours truly is a part of. But in fact, the communist-Chinese-owned magazine and website couldn’t be more wrong in its indictment of Adams as a pioneering scientist and journalist because we deal in often very inconvenient facts about health, foods, genetically-modified organisms and the scoundrels, politicians, fools and corporations that push unhealthy lifestyle choices and medical Stalinism on all Americans. We don’t deal in scientific conjecture, we deal in scientific facts. As for Adams, all of his research is hands-on; we’re betting that Senapathy, from her self-anointed position as arbiter of all that is and is not scientifically true, hasn’t been inside a lab conducting real research anytime lately, if at all. So all she is left with is creating a false narrative that we’re the quacks when in reality we are the ones with facts, data and research on our side. Every few months, Forbes.com runs a hit piece on Natural News, targeting me personally by gathering up a slew of circular logic quotes from representatives of the biotech, pharma and vaccine industries who ridiculously proclaim they all have a monopoly on science. They don’t. And especially Senapathy. 6. Janet Cooke’s imaginary 8-year-old heroin addict: Washington Post—As noted by Breitbart, Cooke, a reporter for the Washington Post, completely fabricated an eight-year-old heroin addict in Washington, D.C., in a report on growing addiction that actually won her a Pulitzer Prize (which has since been revoked). While the story was written in the early 1980s, the Columbia Journalism Review did an extensive piece dissecting it this year dubbing her “the fabulist who changed journalism” (they should have added, ‘for the worse’). 7. Fake newsman Brian Williams slams ‘fake news’: MSNBC—Some of this stuff you just can’t make up (which is hard not to do for a real story about fake news), but it doesn’t get any better than this. You may recall former NBC Nightly News anchor Brian Williams, who fell from grace this year after it was discovered that he faked or lied about several events he allegedly covered while on assignment in various parts of the country and the world. The most [in]famous is his lie that, while in Iraq, he was nearly shot down in a helicopter, while receiving no ground fire whatsoever while in-flight. “It’s curious that Williams is becoming the face of the legacy and establishment media charge against ‘fake news,’ the matter that such media luminaries are rallying around to blame their widely inaccurate reporting of the 2016 presidential election. Williams lost his slot as anchor of the NBC Nightly News after he made up scores of accounts, passing off completely fabricated stories as journalism,” Breitbart news reported, adding that, in 2015, the site published a full accounting of all the lies and fake news passed off as legitimate by Williams—32 times. Embarrassed and hard-pressed to make it “right,” NBC suspended Williams…only to reinstate him on MSNBC, the cable news network with the least amount of viewers (for a reason). They were even making up “official-looking” ID badges—you know, so the “intimidation” would “officially” be tied to Trump’s campaign. Only nothing like that was planned nor was anything like that actually carried out. In fact, the last time real voter intimidation was reported was when members of the Black Panthers political organization tried to browbeat white voters at polling stations in Philadelphia during President Obama’s first run at the Oval Office. But alas, the Obama ‘Justice’ Department, led by Eric Holder, dropped the case. 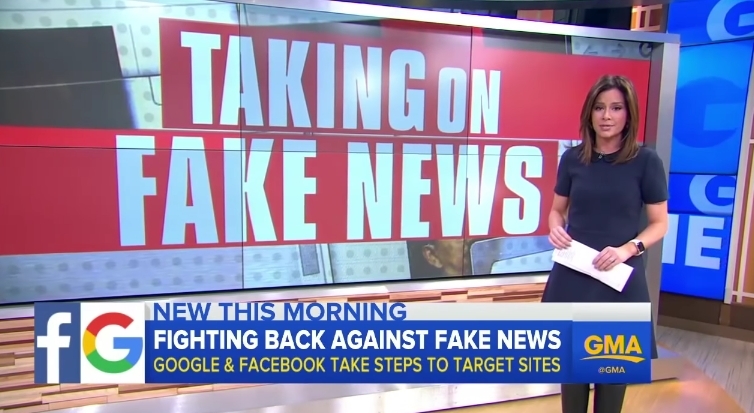 “Fake news was a term specifically about people who purposely fabricated stories for clicks and revenue,” said David Mikkelson, the founder of Snopes, the myth-busting website. 10. Facebook users are ‘fed up with fake news’: USA Today—Perpetuating the ‘fake news’ lie and narrative, USA Today published a piece in mid-December claiming that “Facebook users are fed up with fake news” [are you starting to see a pattern develop here?]. Naturally the story quoted a couple of Facebook users who, indeed, sure sounded like they were ‘fed up with fake news’ on Facebook. Facebook has a fake news problem. And some of its users are fed up with it. They’re not sure if the solution is to let the social network, with its own biases, decide what’s true. Or whether they themselves should become better fact-checkers. Say what? How is Facebook to know whether stories its news aggregators place into the feed are “real” or “fake,” especially given the examples shown on this list? These are all supposedly “reputable” news organizations, yet we’ve shown clearly how they have invented narratives, pushed falsehoods, and lied to their readers repeatedly—yet their stories make the Facebook News Feed. What’s more, who gets to decide what is and is not ‘fake news’? For Facebook, anyway, it is going to be some of the very news and ‘myth-busting’ organizations that themselves have been discredited. Adams has it figured out. “There’s no question that CNN, WashPost and the NYT are all working against the interests of America and the Constitution,” he told me. “The NYT is owned by a foreign socialist. The Washington Post is owned by a left-wing globalist, and CNN is a puppet propaganda mouthpiece for George Soros. “These left-wing propaganda rags are deliberately harming America and seeking to bring down the Trump administration by any means possible, including fabricating false accusations and publishing deliberate faked news stories to push their propaganda. They are subversive and a clear and present danger to our democracy,” he added. Previous :Why is Google News still running fake news sources like CNN and WaPo while banning REAL news from the new media?